Indian ringneck parakeets are declared pests with the potential to damage cereals, oilseeds, horticulture as well as stored grains, and even backyard fruit and trees. They may also compete with native species for nest hollows and food. They not native to Australia, and although widely kept as a cage bird, there are no known populations in the wild. The Indian ringneck, or Indian ring-necked parakeet (Psittacula krameri), is also called the rose-ringed parakeet or African ring-necked parakeet. The Indian ringneck is a long-tailed, grass-green, red-beaked parrot, 37-43cm in length (body and tail). Male birds have a narrow black and pink collar which is absent from female and immature birds. Indian ringnecks are very vocal with a variety of distinctive screeching calls. They can be identified by their typical shrill kee-ak call which is unlike that of any native parrot. Their flight is swift and direct with rapid wing beats. red-rumped parrot (occurs in eastern South Australia, Victoria, New South Wales and southern Queensland). The Indian ringneck is common throughout much of its extensive natural range. It occurs in sub-Saharan Africa and southern Asia from Afghanistan and Pakistan east through India to Myanmar (Burma) and south-east China. Populations resulting from the escape or release of caged birds occur in Europe, the United States, the Middle East, Japan, Singapore and several island groups including the Hawaiian, Canary, Andaman and Maldive islands. Many of these populations are expanding in size and range. Indian ringnecks occupy a range of habitats including semi-desert, open scrub, bushland, evergreen forest, light rainforest and agricultural land with scattered trees. They also inhabit gardens, orchards, towns and cities. Introduced populations are found mainly in cities and towns where they rely on rich fruit-bearing vegetation and bird feeders for food. In England these populations are spreading from towns into rural areas. In Western Australia escaped Indian ringnecks are often attracted to bird feeders containing seed or fruit put out for other species. Indian ringnecks usually nest in tree hollows higher than 3.5m off the ground, but they can also use holes in rock faces, roof cavities and walls. They eat a wide variety of foods including cereal grains, legumes, fruits, nuts and blossoms. 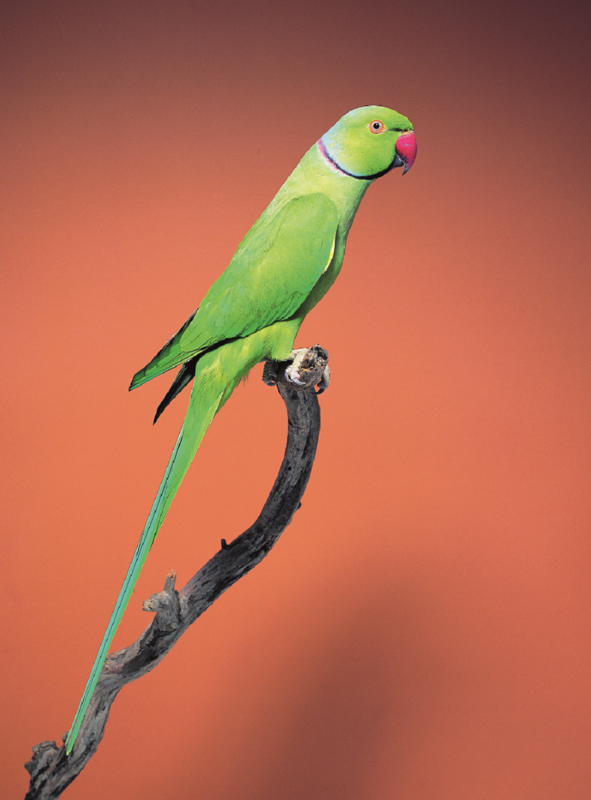 Indian ringnecks are assertive, adaptable and resourceful. Being social birds they are usually seen in small groups but they can form large flocks of hundreds at roosts and food sources. The species is long-lived, commonly surviving in captivity for 20 years. The Indian ringneck, like many of its parrot relatives, is a major pest of agriculture within its natural range. Large numbers of ringnecks raid crops and grain storage facilities causing enormous losses. A variety of economically important crops are attacked including barley, sunflower, nuts and fruit such as mango, guava, fig, grape and peach. Introduced populations eat and destroy fruit as well as damage trees in orchards, vineyards, parks and gardens. They are thought to compete with native species for nest hollows, often occupying them before native birds begin to breed. Large numbers living in parks are a nuisance because of noise and damage to trees. The Indian Ringneck is rated as being highly likely to establish populations in Australia and become a pest of agriculture, the environment and public amenity. A scientific risk assessment conducted by the Department of Agriculture and Food in Western Australia and endorsed by the national Invasive Plants and Animals Committee indicates that the Indian ringneck poses an extreme threat (the highest of four categories) to Australia. Part of the assessment showed that the climate of the ringnecks’ overseas range is similar to Australia’s climate. Indian ringnecks could threaten biodiversity here if they become established so it is important to report birds seen in the wild. Native parrots such as rosellas and the endangered swift parrot may be at risk from competition for nest hollows. Agricultural crops such as sunflowers, other oilseeds, grapes and other fruit could be at risk. Large numbers of Indian ringnecks are held in captivity in Australia but there are few requirements in place to ensure they remain secure in their cages. Because they are so common, many ringnecks have little monetary value. While handsome, they can bite hard and can be very noisy. These factors contribute to many birds escaping or being released into the wild, and states and territories may carry out control programmes to remove them. Between 2005 and late 2007 at least 25 Indian ringnecks were removed from the wild in Western Australia. Some of these birds are thought to have survived in the wild for at least four years and two groups had reportedly bred. Several captured birds had leg bands that identified them as originating with bird breeders. In 2017, twenty Indian ringneck parakeets escaped their cage on 6 August 2017, from a backyard aviary. DPIRD initatied a response to recover the birds, but as of end of 2017 some 13 parakeets remained unaccounted for. Many Indian ringnecks are caught using cage traps and relocated to the care of responsible bird keepers. Different colours, including blue, yellow, grey and white, have been bred in captivity and become common. The Western Australian Organism List (WAOL) contains information on the area(s) in which this pest is declared and the control and keeping categories to which it has been assigned in Western Australia (WA). Use the links on this page to reach Indian ringneck parakeet in WAOL. To help prevent Indian ringnecks from establishing in the wild and becoming pests in Australia it is essential that they are maintained in secure (preferably double-door) cages. Unwanted birds should be surrendered, not released and any seen in the wild should be reported to the relevant government department or wildlife authority so that appropriate action can be taken.